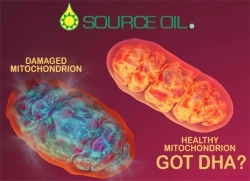 South Lebanon, OH, May 14, 2018 –(PR.com)– Source-Omega (www.source-omega.com) today asserts the newest DHA omega-3 structure-function claim filed with the FDA to demonstrate how their exclusive product, SOURCE OIL® – Water Extracted Chromista Oil – best supports mitochondrial health and maintenance. SOURCE OIL is the first and only 50% DHA algae oil that is also the first and only water extracted algae oil offering the highest quality, purity and potency. Source-Omega’s own publication reviews support 1200 mg DHA per day for 90 days as an average ideal intake level. Accretion is the act of building-up stores or reserves in the form of higher DHA levels over time, yet accretion is naturally limited to an average ideal level of about 8% total omega-3 membrane composition, thus posing no risk of overdose or side effects. Most people persist at about 4% total omega-3 membrane levels and have very little, if any, DHA in their mitochondrial cardiolipin. Source-Omega, LLC is the leading Chromista algae oil innovations company since 2007 serving the public health using a unique water extraction process, lowering prices and improving quality. Preformed DHA has also been defined in Source-Omega’s publications to be safe and effective for adults at 1200 mg DHA/day. The company defined 1200 mg DHA/day as a best practice for adults and showed how the liver can rapidly make EPA from DHA in just the right amounts (Doughman et al., 2013).